Welcome to the Holiday Hangover $50 AMEX Gift Card Giveaway Event! 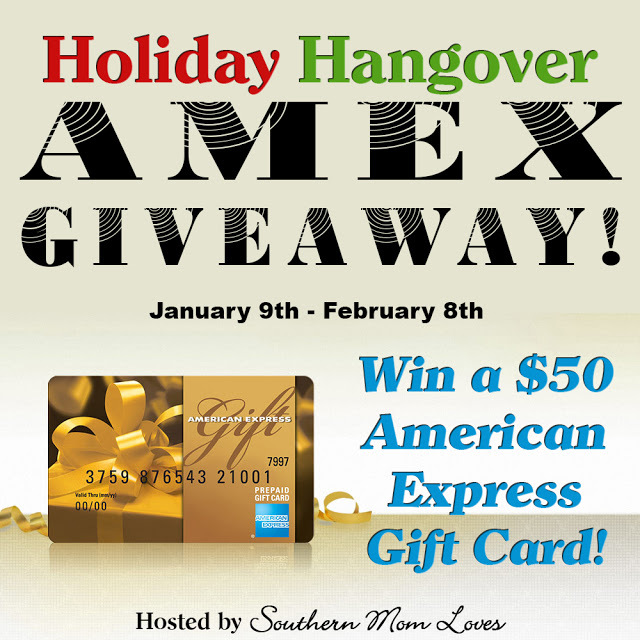 Holiday spending can leave you with a financial hangover, so I got together with some lovely bloggers to bring you the Holiday Hangover event where one lucky reader will win a $50 American Express gift card to help them recover from the holidays! Giveaway begins on 1/9/16 at 1:00 am CST and ends on 2/8/16 at 11:59 pm CST. Must be 18 years or older, open to residents of the US ONLY. Once confirmed, the winners will be added to the Southern Mom Loves Winner’s List. Previous post: Nutrisystem Turbo10 New Year, New Weight Loss Plan! I would let me kids pick out a special surprise. I’d spend the gift card on photography supplies that I need for class. I need to buy 3 birthday gifts for two of my kids and husband. It would go towards that. I would buy a new outfit for my interview! I would use it for gas to go visit my son in SC. I would use this to go toward getting a new washing machine. I would use it toward a waterproof ipod. Something for my daughter. There’s always something you need for a 1.5 year old! Take my son to lunch.. I would buy shovels and rakes and implements of destruction needed for spring gardening. I would use this to pay bills, like so many I over extended for Christmas. It would be so wonderful to win this AMEX card giveaway. I would spend it on a relaxing dinner with my boyfriend. I might spend it on buying some jewllery for my mom as her birthday is coming soon. I’d use it for something fun. Love to win American express cards! I would like to get a board game or video game or both. Need Tires for my Mustang, it would help in the effort. I would probably use it to stock up on things for the house. Not working now due to some back pain issues. I would probably use it for day to day expenses – personal items, gas groceries, etc. I decided this year, I was going to get healthier. If I won, I would probably use it towards some workout clothes. I’ve been sweating to the oldies! I would probably get clothes. Maybe a nice blouse or new pj’s. I would love to have a new workout outfit. I would spend it on groceries. Good luck everyone. Would love to say it would go for something frivolous but it would likely go for groceries. I would love to use this to get my sister a lovely birthday present. She loves Sephora, so probably something from there. Thanks for the chance! I would probably spend it on things I need for around the house, like dish and laundry soap. We would spend it on groceries.. boring but necessary! I would probably use it either to buy something for my wife or for my daughter. My daughter does love Frozen stuff! I would love to use this gift card for some new books! I’d probably use it to go see a movie with my husband or go to dinner. We don’t get to go on dates very often. I would probably spend the gift card on something for around the house. I would spend the $50 Amex gift card on my medicine refill. It would come in very handy as it seems everytime I turn around I need to refill them! I need some things done on my truck so this would go toward getting what I need for that. I would use it to buy Kitchen Supplies! I’d give it to my son for his birthday. I’d probably spend it on clothes for my son. I would spend the gift card on winter clothes for the kids. I would use it for Valentine’s Day! If I should win this, I would be spending it on some home repair item, I just know it. I have to re-paint a few rooms here. The have not been painted in 14 years. It’s time. I would love to win 🙂 I’d love to ask a girl out on a nice date and maybe go out to eat and go to a movie <3 ! I will spend the winnings on things I need for my new baby coming in April ?. I love entering contests! I would use this gift card for online shopping! I would probably get me some new work boots! I would use the card on a birthday gift for my son. If I won this gift card I would spend it on a new winter coat at an after Christmas sale. I would probably use it for a nice dinner out with my husband.